Manetas' "I AM GONNA COPY"
"Writing everything in a book is like leaving a sword in a child's hand"
invented quote attributed byJorge Luis Borges to Clemente Alessandrino's "Stromateis"
An art movement for the computer age, couldn't be better introduced by anyone but Jorges Luis Borges. I met Borges on Sept 3 1983. I was walking down the Panepistimiou Street toward Omonoia Square and he was slowly - assisted by Maria Kodama- walking his way to the opposite direction, towards Syntagma. Our eyes and bodies met for just a second but that second was to last- as memory- for the rest of my life: one of my most precious and vivid memories of an encounter that could have happened, but never did.. This book is not a Neen book. Alas, Neen is not what it looks like when you see it in pictures; neither can it be described by words. Risking appearing mystical, I would say that the whole of Neen is larger than the sum of its parts. That’s also because Neen started from the word itself—it was only a sound without sense when we bought it from the Lexicon Branding, it was just a feeling really, and later it met some of its expressions in the works and the activity of the people who are included in this volume. Most of these works are animations and Web sites, but Neen can also be found in industrial design and fashion, in music and poetry, or in certain contemporary life coincidences such as looking at your watch and noticing that it’s 4:44 am. Even some people’s style can be Neen (such as: “This person is very Neen!”). Last century’s concepts of cyberspace, contemporary art fashion, and style slipped together with us into our present and they are now the same they were before, but still a bit different. This universe is animated in a different way than the one before 2000 and Neen is definitely an element of this newly Animated World. "above all works by Lucio Fontana"
You got paid $8 per hour to do nothing really, just look at computers and the Internet and play video games. You were free to do anything you wanted to, but if you created stuff that looked like contemporary art, or design, you would lose your job. 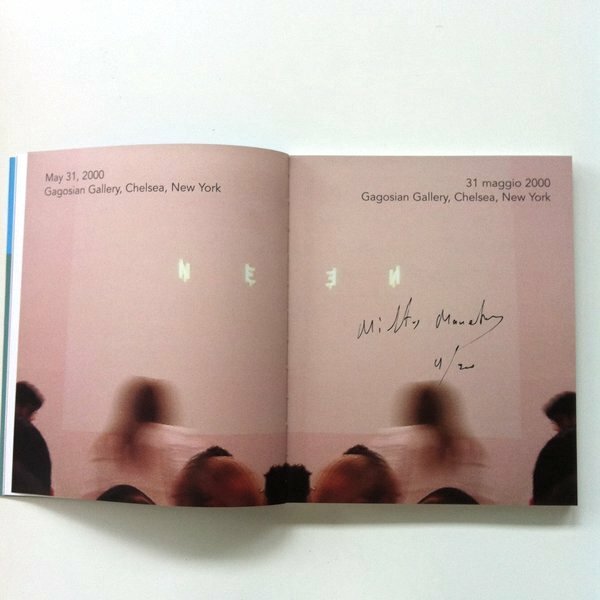 2003, angelo plessas (very upset with you), mai ueda (a "retrospective"), yi zhou, textfield magazine magazine (launch party, whitneybiennial.com (release of exhibition final version), carbonated jazz (performance), afterneen (presentation of the group show "afterneen" at casco, holland) Sept 2003: The EO in LA, becomes TELIC, curated by Christian Moeller. The electronicOrphanage is now a nomad. "They are professionals. They find names for whatever. They charge an average of $ I00.000 to $150,000, and they offer different names from which to choose and to purchase. " To become a public persona not only using the available media but transforming oneself into media, which is more than being a popstar or a flaming sun. A NEENSTER is a pro­ducer, not a product. NEENSTERs do things not as a job and not even for creativity or self-expression. "You mean that your paintings look better as JPEG pictures on the Net than they do in a living room in Paris's 16th arrondissement?" An artist after Videogames should not create anything himself but only extract the hidden notions of the game. He should do that, by examining carefully the parade of symbols the game is offering. A Painter doesn't eat a piece of bread but paints it. Artists after videogames don't play videogames but relate to them. ENGLISH-NETHERLANDS, & NETHERLANDS-ENGLISH. Neen was always present at MU's office! And now you’re doing this project with the U-Haul trucks and WhitneyBiennial.com. Why? Because the domain was available. It was the official show’s unconscious desire. I see all this as a commission by them. Like a Coca-Cola advertisement where they left a little window open: You can put your mark there. SALON.COM, THURSDAY, MAR 21, 2002 , John Glassie: "The man from Neen"
And then, a miracle happened. A computerized Mercedes, driven by a drunken kid, collapsed at the space of Casco and destroyed everything. It was a cruel accident because one of the people who was working there was seriously injured, but it was also significant: a real crash between our World and the World of the computer screen. Some of these buildings were inspired by Neen works such as Mai Ueda’s philosophyinthebedroom.com, Rafaël Rozendaal’s whywashesad.com, and Angelo Plessas oneaftertheother.com. Other buildings like Blue Wave and Teleport Forest were inspired as a natural landscape for the Web, and others were just a psychological profile of the NEENSTAR, like Miltos Manetas’ tower or Nikola Tosic’s cave. this show stayed open only for a minute, on April 4, 2004 at 4:44 pm, and closed just 60 seconds later. The exhibition was commissioned by Alexandre Pollazon. You can find some cool places to hang out on there and create a certain behavior as in real-life situations. It is very interesting to see how easily social relations are changing there, too. If you get the chance to play with famous online players, then it feels like being in a V.I.P. Hollywood party. These stars, as in every kind of society, have their ups and downs. The death of an online player in a role-playing game can be a bigger headline on Google News than, for example, if Tom Cruise is gay or not. I don’t know if these societies are better places, but we can surely give it a try. 2. Use a projector to display the picture you want to paint on the canvas. If you know how to draw, do not make paintings: make Flash animations instead. Neen like Janus contains the circle of time and life, therefore the future of art.